Citation Information: JCI Insight. 2018;3(10):e120362. https://doi.org/10.1172/jci.insight.120362. Idiopathic pulmonary fibrosis (IPF) is a fatal fibrotic lung disease that is associated with aberrant activation of TGF-β, myofibroblast differentiation, and abnormal extracellular matrix (ECM) production. Proper regulation of protein stability is important for maintenance of intracellular protein homeostasis and signaling. Ubiquitin E3 ligases mediate protein ubiquitination, and deubiquitinating enzymes (DUBs) reverse the process. The role of ubiquitin E3 ligases and DUBs in the pathogenesis of IPF is relatively unexplored. In this review, we provide an overview of how ubiquitin E3 ligases and DUBs modulate pulmonary fibrosis through regulation of both TGF-β–dependent and –independent pathways. We also summarize currently available small-molecule inhibitors of ubiquitin E3 ligases and DUBs as potential therapeutic strategies for the treatment of IPF. E1, E2, and E3 enzymes mediate protein ubiquitination, which is reversed by DUBs. 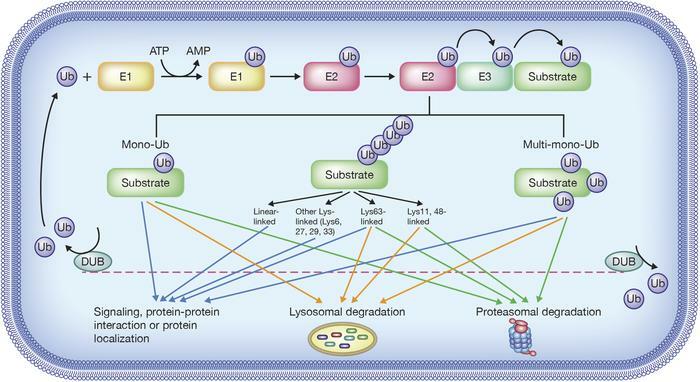 The balance between the actions of ubiquitin E3 ligases and DUBs controls ubiquitin pool dynamics, protein homeostasis, and cellular functions. Illustrated by Rachel Davidowitz.